It's a fact of life that puppies get messy. However, a recent visitor has a question about urine stains on a puppy she is thinking about purchasing. Visitor: Will Urine Stains Come Out? I am considering purchasing a puppy that has urine stains on his leg and thigh from another dog urinating on him. The seller says it will eventually come out after many washes. Is there anything that will take it out quicker? Could the urine have damaged the skin of this pup? For urine to stain fur, it has to be allowed to set in. The pup in question must have been peed on and left unwashed for some time, which makes me wonder about the level of care the pup has received during its time with the breeder. Are these stains predominantly on the back of the pup's legs and in between? This would indicate the puppy had been sitting in urine, not being urinated on. If the urine stains are only on the outer thighs then it could have happened just as the breeder said. Either way, the pup wouldn't be stained if it had received reasonable grooming. 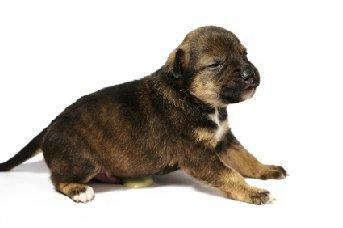 Part the puppy's fur down to the skin and look for signs of redness, irritation or peeling. This would indicate urine damage and basic neglect. Note how far into the coat the staining goes. If it's skin deep, then the pup didn't receive proper bathing. How quickly the stains and smell come out depends on the type of coat the puppy has. A short-coated puppy will shed out the stained fur as its adult coat comes in. A long-coated puppy will retain the staining longer, but it can be trimmed away as the coat lengthens. There are shampoos that will help lighten urine stains. You might also try one of the products made to combat tear stains to see if it removes the yellowing any quicker. The good news is, once you get the staining out, simple routine bathing will keep your puppy looking good.